"Black dress, with the tights underneath"
Wow you really got long legs btw, you look pretty! OMGGGGG. 3OH!3??? I lurrve them! How on earth did your school get them to come over and perform?!! Cute outfit! I wrote about tribal prints the other day. They are cute! nice print! love your pants too! great! I would've thought that cropped tank came from AA. Cute nonetheless. I like how you paired the print with the purple cords. They go really well together! Great outfit...lovely pics and post! I LOVE your outfit! Those purple cords are beyond incredible! I need to play with colored bottoms more, they look incredible and really make a outfit pop. You look great!! !Love your pants! that was just wrong!!! hilarious, but wrong..
those purple pants are awesome by the way! I love your tribal print shirt! love the color of your pants and the hat!!! Great look! 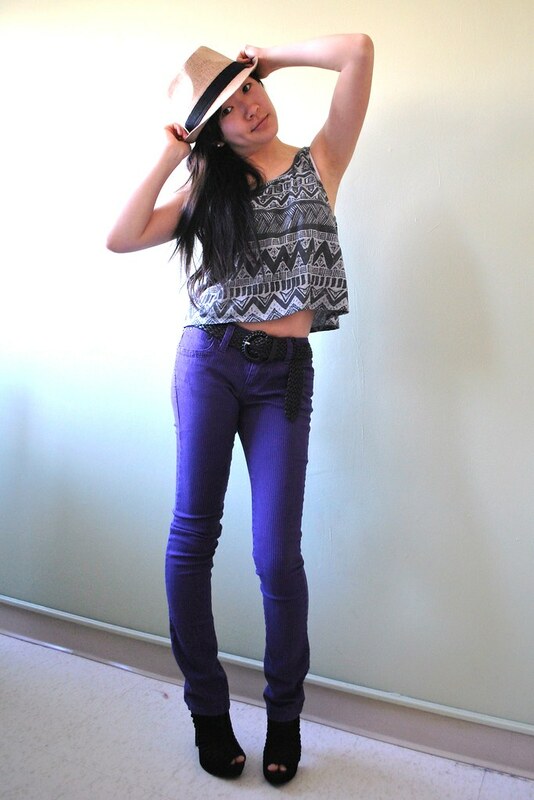 love the purple pants! i just got some red ones which i'm loving!